The last weekend in January was really nurturing for me this year because I got to do some of my favorite things despite the extremely cold weather and my completion of a second round of the seasonal bug that so many people seem to have this January. On Friday night I went to one of the best Jazz sets that I’ve been to in a long time. The venue was Dizzy’s at Jazz at Lincoln Center, http://jalc.org/dizzys The outstanding performances were by Cyrus Chestnut, piano; Stacy Dillard, saxophone; Neal Smith, drums; Dezron Douglas, bass; and special guest Jimmy Heath, saxophone. It was celebration of Cyrus Chestnut’s 50th birthday. The joy in playing the music composed mainly by Cyrus was evident in the performances all of the musicians. The musical conversations between the players produced a rich, smooth and heavenly set. On Saturday I was invited by my dear friend and colleague to do a special 2013 Intentions Group with her interested psychotherapy clients and acquaintances . There were thirteen participants in the group. Many of them had never heard of energy healing or Resonance Repatterning. With the wonderful energy of my colleague and her home as our foundation, we quickly entrained with each other. The repatterning was the powerful Nun Karma Repatterning, which anyone, anywhere can access for free by clicking on the picture of the nuns shown on this blog. One of the most exciting parts of the session for me as the practitioner was my muscle checking to use Infinity Healing as the four minute modality to finalize the energy shifts and energize the new intentions.. It was the first time that I used Infinity Healing with thirteen people and transmitted the energy to each individual according to the dictates each person’s higher self. Sunday was an extremely productive day. I wrote all of the needed updates about Infinity Healing soon to be included on www.beyourbliss.info. 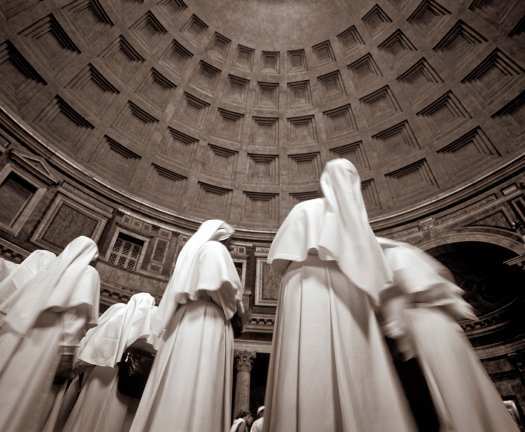 The Nun Karma Repatterning- click on the picture of the Nuns in the domed cathedral. Finally, I’d like to share with you some pictures of the performance at Dizzy’s and share my newly completed winter Zen garden. The rock garden will disappear again when the flowers adorn the space. This entry was posted in Infinity Healing, New York City Community News & Events for RR, News About the Group, Notes from Meryl, Private Practice Notes and tagged 2013 Intentions, balcony gardens, consciousness, Energy Healing, Infinity Healing, NY City attractions, Practitioner Skills Development Group, Resonance Repatterning. Bookmark the permalink.